Shepherds Arms Football Club, surprisingly operates out of the Shepherds Arms pub which is located in Horbury, near Wakefield in West Yorkshire. The Shepherds Arms Football Club was established in the year 2000 and entered the Wakefield Express Sunday League for the season 2001/02. 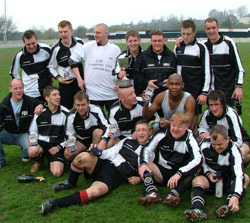 Following mixed seasons - season 2004/05 saw The Mighty Sheps lift their first ever trophy by winning the Division 4 league Cup with an emphatic 5-0 win over Flanshaw and securing promotion in 2nd place to Division 3. Even in the previous years when the Shepherds Arms had a team, trophies always eluded them. Hopefully this has changed for good. Shepherds Arms FC was the first of the teams to be formed and plays its games within the Wakefield & District Sunday League. The past seasons have seen The Mighty Sheps gain promotion only to drop back to the 4th Division the following season and then to have by far their best ever season. The League Cup is the first trophy that Shepherds Arms FC have won in their entire history and things are looking as they are going from strength to strength. This season - 2005/06 has seen several new players added to the team to try and ensure their rise through the divisions and win some more of that so treasured silverware. Shepherds Arms FC is currently run by Steve Rowbottom - aka - The Fat Bald Kid. Steve is a Director of Precision E Ltd and currently sponsors the Sunday team in their now familiar Black & White kit. AFC Shepherds Arms is our Saturday team which plays its games within The Wakefield & District FA League. The team, formed in 2005 following the dispansion of Wakefield City IV's, are currently enjoying their football in Division 1 and hopefully looking to go to the heady heights of the Premier Division in seasons to come. Following the transfer of all the players, AFC Shepherds Arms are comfortable in their first season in Division 1 and have been unlucky with several results. The team is jointly run at present, with last seasons Manager - Chris (Duzza) Durham and Steve Rowbottom - aka - The Fat Bald Kid - yes its him again. AFC Shepherds Arms play in all blue and are sponsored directly by the pub.